Unusual erosion patterns that exposed striking hidden towers soaring more than 200 stories above the base of a canyon that is not a canyon; a national park that has effectively removed the impact of humans on the night sky to preserve the night sky humans once enjoyed, Bryce Canyon is an enigma, but also one of the most beautiful places we’ve visited. It’s hard enough to describe a hoodoo and how it’s formed, but to describe the entire park is even more difficult. I think it’s just best to show you the views from inspiration point. Bryce Canyon is actually not a canyon, since canyon’s are formed by rivers… the beautiful ampitheaters are actually created by headward erosion. 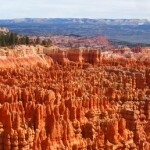 Hoodoos are what’s left when the soft sediment around each tower is eroded by freezing and unfreezing water.